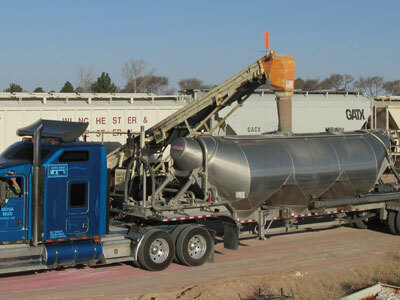 In 2011, Nova Frac Sand began transloading frac sand from our rail spurs. Nova Sand boasts online real time inventory management system so that customers know exactly where there product is at all times. We have increased our capability to transload and store sand, currently running 6 transloaders that can load trucks in under 5 minutes safely and efficiently. Our facility now includes inside transloadable spur space for 360 rail cars. Nova has another 350 rail car storage on adjacent spurs in our complex. Nova’s unique frac sand storage buildings are designed to store up to 3.5 million pounds each. Nova now has additional patent pending sand storage capability of over 25 million pounds with more on the way. Our operations currently transload upwards of 50 million pounds per month, and we have the capability of transloading 100 million. Nova also has 360 thousand square feet of dry storage for specialty sands being handled in super sacks. Nova’s new facility has two on-site scales which means faster delivery of our customers product. Nova Frac Sand currently operates 27 trucks with new pneumatic trailers to deliver frac sand to well sites and can safely coordinate logistics with other trucking companies. Nova Sand now offers Guar services to our customers. In addition, Nova Sand offer 3rd party sand yard management, we can increase your efficiency and lower your costs.